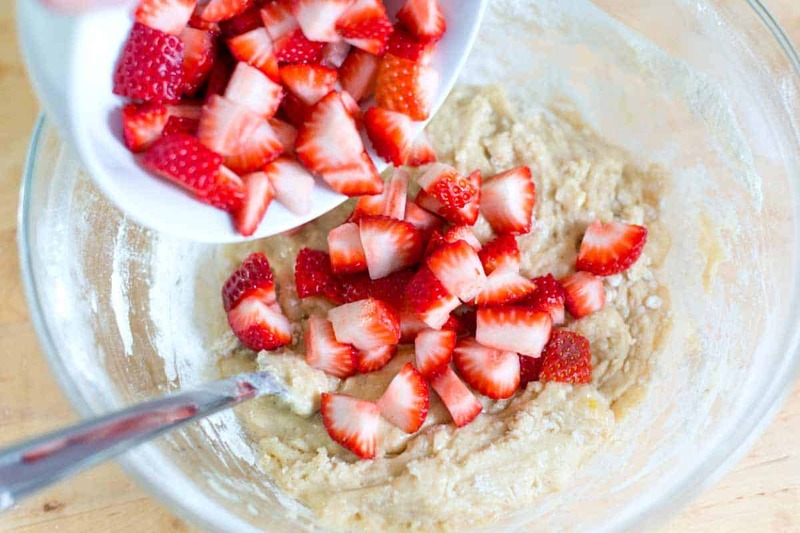 How to make perfect strawberry muffins with a lightly spiced batter and fresh strawberries. 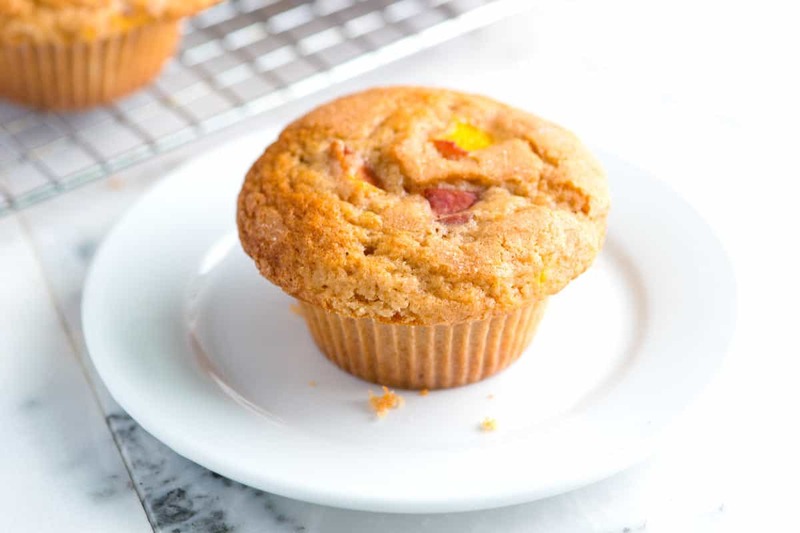 Jump to the Strawberry Muffins Recipe or read on to see our tips for making them. If you’ve been following us for a while, you might have noticed that we love muffins. When I’m in the mood to bake, but not to do dishes, muffins are my go-to. 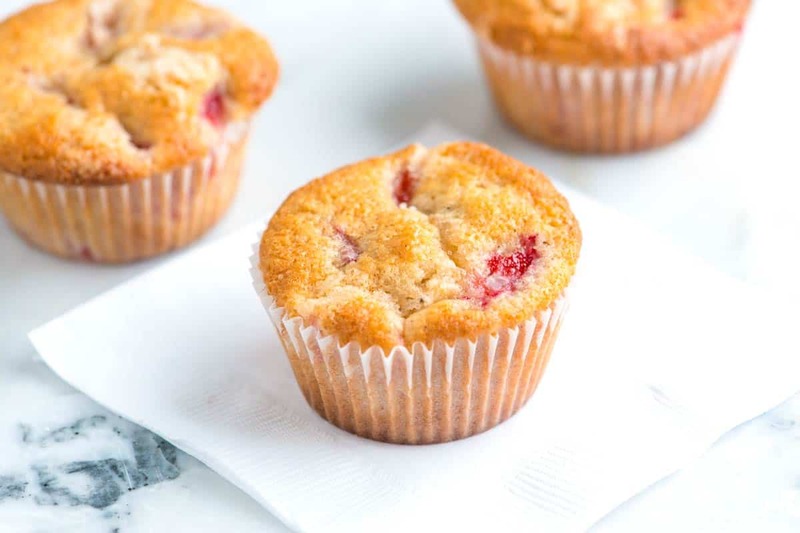 These strawberry muffins are perfect — they are so simple and quick, you could make them in the morning for breakfast. We make a version of these muffins all the time — sometimes swapping strawberries for other fruits like blueberries. The batter is very simple — just flour, baking powder, a little oil, egg, milk and vanilla extract. 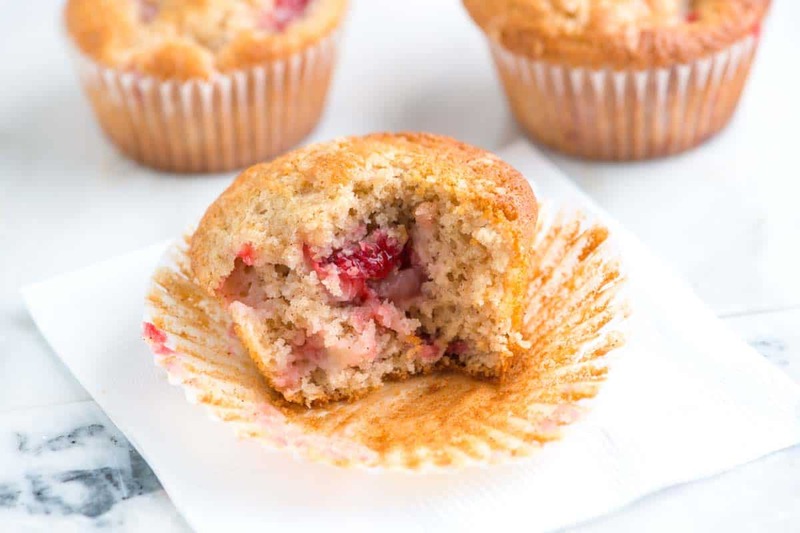 In the strawberry muffin recipe below, you’ll notice we added a few extra spices to the batter — cinnamon and finely ground black pepper. It’s not often you see black pepper in sweet baked goods, but trust us, it’s so good. You don’t specifically taste the pepper, but it sort of lifts the flavor of everything in the muffin. Try it, we really love it. Try to use strawberries that are sweet and flavorful for these muffins. If you can’t find them, try other berries — blueberries, blackberries, raspberries or cherries would be amazing. Just before baking, we add a sugary top to the muffins. It’s completely optional, but we love the tiny bit of crunch it adds once they’ve baked. 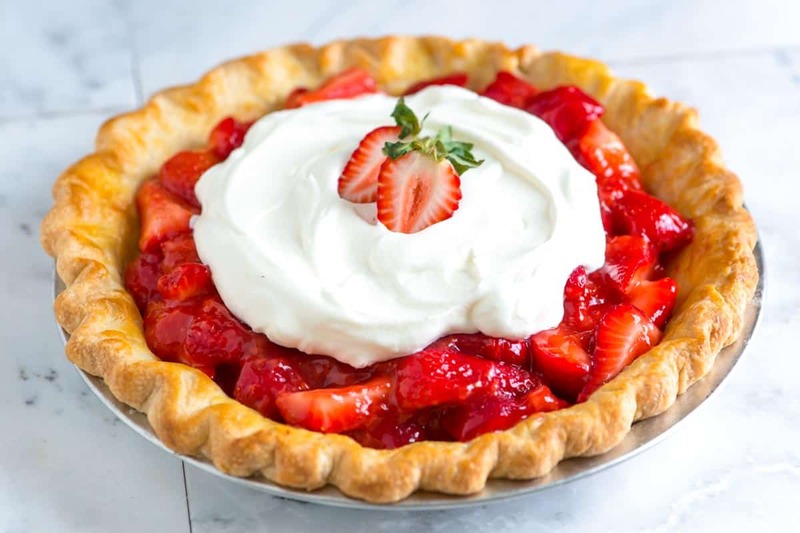 YOU MAY ALSO LIKE: This fresh strawberry pie recipe with sweet strawberries coated in a light strawberry glaze then topped with whipped cream. Jump to the Strawberry Pie Recipe. 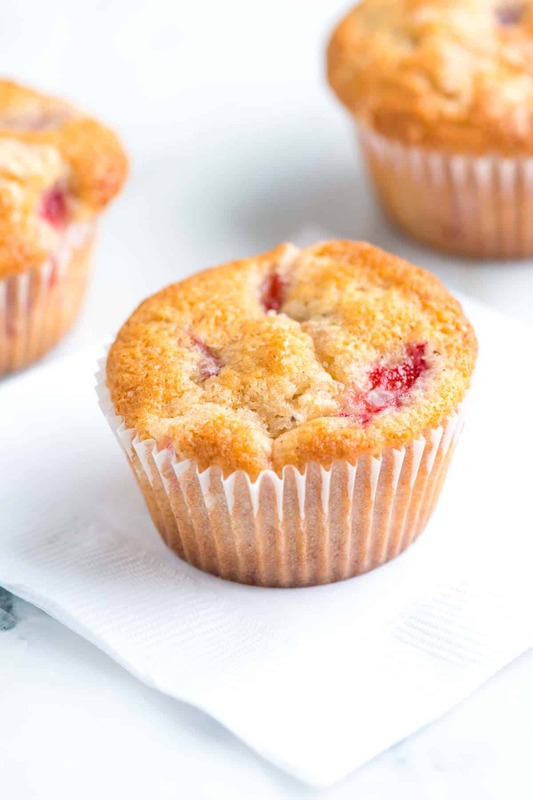 These light and airy strawberry muffins are very simple to make. We love adding a light spice to the batter with cinnamon and finely ground black pepper. The black pepper is a little unusual, but by adding just a small amount it lifts all the flavors in the muffins. Feel free to leave it out, but we highly recommend it. Whisk flour, sugar, baking powder, salt, cinnamon, and the black pepper in a large bowl until well mixed. Using a measuring jug that holds at least 1 cup, measure out the vegetable oil. Add the egg then fill the jug to the 1-cup line with milk (this should be 1/3 to a 1/2 cup of milk). Add 1 1/2 teaspoons of vanilla extract and whisk until blended. 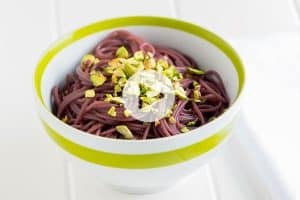 Pour into the bowl with flour and stir with a fork until just combined. Do not over mix. (The muffin batter will be quite thick — see note below for more details). Stir in the strawberries. In a small bowl, stir 1 tablespoon of sugar with a 1/4 teaspoon of vanilla then set aside. Divide batter between the 12 muffin cups. (The batter will come close to the tops of the paper liners). Lightly sprinkle vanilla sugar topping over muffins. Bake muffins until tops are golden brown, no longer wet and a toothpick inserted into the middle comes out with crumbs, not wet batter; 15 to 20 minutes. Transfer to a wire rack and cool completely. Batter Thickness: The batter should be thick and scoopable — not runny and not dry or extra thick like bread dough. If the batter is too runny, add flour, a tablespoon at a time until correct consistency. 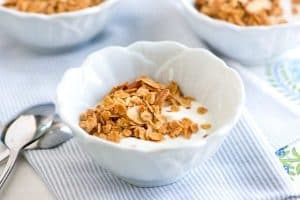 If batter is dry or too thick, add milk, a tablespoon at a time until correct consistency. 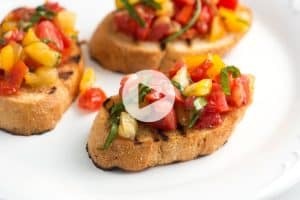 Nutrition Facts: The nutrition facts provided below are estimates. We have used the USDA Supertracker recipe calculator to calculate approximate values. We assumed reduced fat milk.